A female focused event celebrating and inspiring women in the music industry. 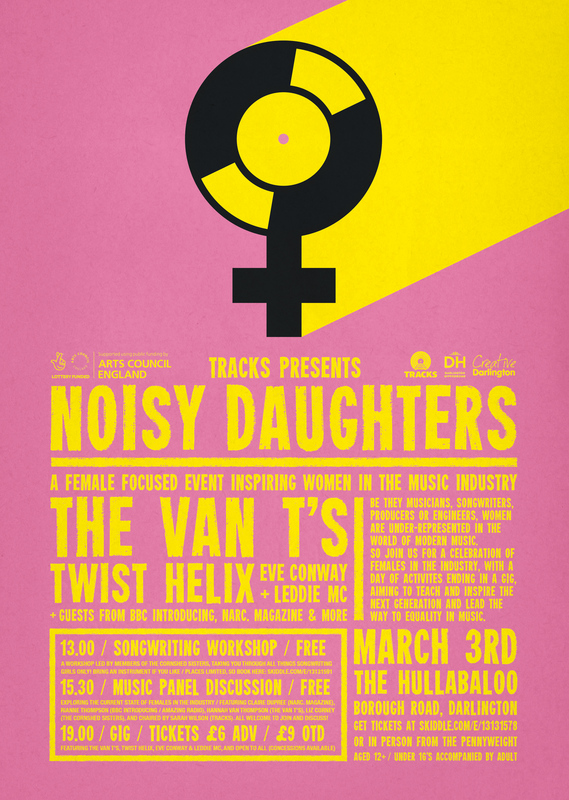 Following on from our successful 'Womenfolk' show in Oct 2017, we're delighted to announce our first Noisy Daughters event on Sat 3rd March. It's a programme of activities at the brand new Theatre Hullabaloo that celebrates females in music, with an aim to teach and inspire the next generation and lead the way to equality in music. DISCUSS - Panel discussion (3.30pm-4.30pm) around the topics of issues facing women in the music industry today and what can be done to make a change. Panellists include Rianne Kate Thompson from Amazing Radio/ BBC Music Introducing on BBC Tees, Hannah Van Thompson (of the Van T's), Claire Dupree from NARC. Magazine and Liz Corney, with Sarah Wilson from Tracks/ Big Little Gigs chairing. ALL WELCOME! ENJOY - Evening performance (Doors 7pm) from female artists in the form of BBC 6 Radio playlisted singer-songwriter Eve Conway, much hyped hip-hop act Leddie MC and energetic electro-pop pioneers Twist Helix. Headlining the night is hotly tipped Scottish 4-piece, The Van T's whose ‘surf-pop with rock swagger balanced by sugar-pop harmonies’ have gained the attentions of radio DJs and music publications around UK and Europe. ALL WELCOME! The workshop is open to females only, but the panel and the gig are open to all, as we feel it's important for everyone to understand the challenges that need to be overcome to make the music industry a more inclusive place, and the gig will be a right little shindig! Or physical tickets can be purchased from The Pennyweight.